Whistleblower claims officers from Scottish drug enforcement unit burned files in a cover-up bid. 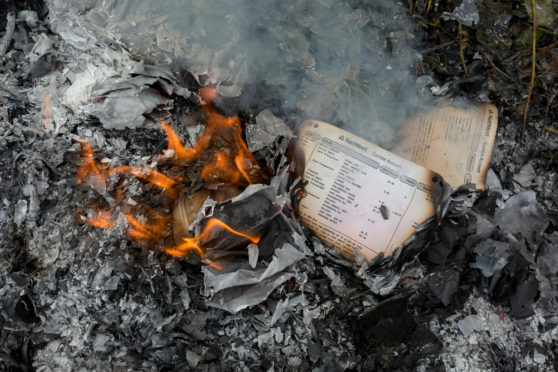 The politicians yesterday stepped up calls for an independent inquiry into why the now-defunct Scottish Crime and Drug Enforcement Agency (SCDEA) burned piles of documents after an undercover unit was exposed as a financial, possibly fraudulent, shambles. They demanded an external force is immediately asked to investigate despite Police Scotland deciding to appeal against a judgment ruling a former officer was unfairly scapegoated and frozen out of her job for exposing the serious mismanagement at the unit. In unchallenged evidence, she had told the Court of Session how officers had been ordered to buy petrol and a garden incinerator and burn documents and paperwork found at the chaotic offices where covert operations were managed for the SCDEA. Yesterday, Holyrood politicians said Police Scotland’s appeal against Lord Brailsford’s judgment must not delay an independent inquiry. John Finnie MSP, chairman of the parliament’s powerful policing committee, said the incident in 2011 must now be examined and has written to chief constable Iain Livingstone urging him to invite a force from England or Northern Ireland to investigate. Mr Finnie, the Scottish Greens’ justice spokesperson, said: “Notwithstanding an intention to appeal, very real concerns exist about burning of documentation. “Police Scotland will suffer significant reputational damage if they don’t act now on these deeply worrying accounts and call in an external force to examine whether any criminality or disciplinary offences have taken place. A whistleblower, known in court as Mrs K, raised the alarm when she found bank cards, credit card statements and cash not linked to any undercover operations at the out-of-town unit where the financial infrastructure around covert operations was managed. The ex-undercover officer won a civil case against her former bosses on January 31 but Police Scotland intend to appeal. She described visiting the unit on a nondescript industrial estate with her bosses and said it looked “ransacked”. Her bosses described it as a “total disaster”. One allegedly kicked a chair in her direction before she was told “nobody would ever know about this”. She was then told the paperwork would be destroyed. MSPs insist that Police Scotland’s decision to appeal the ruling need not delay an investigation into the apparent cover-up. We told last week how the documents were incinerated before the possibility of fraud was reported by the SCDEA to prosecutors. No action against the officer previously in charge of the unit was pursued. The quality and transparency of an internal inquiry undertaken by the SCDEA at the time was also questioned during the civil action. Scottish Liberal Democrat justice spokesman Liam McArthur MSP, who has led calls for an independent inquiry, said: “This case has raised serious allegations of mismanagement and the possible misconduct of those working at the former Scottish Crime and Drug Enforcement Agency. “While the police confirmed they intend to appeal elements of this case relating to human resources handling, this should not be used as a justification for putting a wider probe into the serious allegations at the heart of this case on hold. Yesterday, Police Scotland said: “Allegations raised in this case relate to the legacy Scottish Crime and Drug Enforcement Agency which ceased to exist after the formation of Police Scotland in 2013. “Investigations were carried out at the time by officers from the professional standards department of both the legacy Strathclyde Police and the SCDEA. Independent advice and direction was sought from the area procurator fiscal by SCDEA senior management. “No allegations of documents being burned were made to SCDEA senior management at the time. The retirements of the national force’s deputy chief constable, Johnny Gwynne, who was number two at the SCDEA at the time, and Stephen Whitelock, lead investigator at HM Inspectorate of Constabulary, who was number three, were announced just before the judgement was published but both deny any connection. Police Scotland say Mr Gwynne had informed the Scottish Police Authority of his retirement plans just before Christmas last year. His retirement was announced, as is customary, at the next SPA public meeting on January 30, the day before the judgement came out. Yesterday, Police Scotland said any implication of a link to Mr Gwynne’s retirement would be “completely inaccurate and misleading”.